The former Scottish health secretary has slammed SNP leaders for losing crucial votes by “jumping too far ahead of public opinion” on a second independence referendum. Alex Neil, MSP for Airdrie and Shotts, said the nationalists’ performance in the General Election - in which they lost 21 seats - was in part due to a sense among voters that the party had given up on “the day job” of improving Scotland’s national services. The ex-cabinet minister is the latest senior SNP figure to question the leadership of Nicola Sturgeon and her staff, who claimed that a Brexit vote was grounds for another vote on the constitutional future of Scotland. Mr Neil also called for reforms in health, education and housing policy. 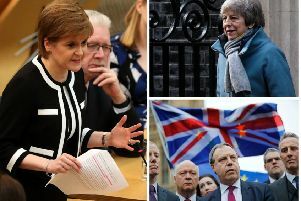 His comments come after SNP plans for a second independence referendum suffered a major setback as the party saw dramatic losses in the election with former first minister Alex Salmond and depute leader Angus Robertson amongst those ousted. Mr Salmond blamed a late surge in support for Jeremy Corbyn’s Labour for the SNP’s defeat in many seats, with the nationalists also losing John Nicolson, Mike Weir and Tasmina Ahmed-Sheikh. Pete Wishart, who was the chair of the Scottish Affairs Committee in the last parliament, held on to his Perth and North Perthshire seat by just 21 votes, with Tory MEP Ian Duncan coming close to ousting him. Labour gained a number of seats back from the SNP - with the party making a return to winning ways in Scotland’s largest city, taking the seat of Glasgow North East from Anne McLaughlin. Ian Murray, who had been the only Labour MP in 2015, retained his Edinburgh South seat with a massively increased majority. The Liberal Democrats also enjoyed success in East Dunbartonshire, where former UK government minister Jo Mr Salmond said: “The Scottish National Party have lost many fine parliamentarians this evening, and that is a grievous blow to the SNP. “But overall the results in Scotland show the SNP will have won a majority of seats in this country and a majority of the vote - something which I suspect the Prime Minister would like to be able to claim in the early hours of this morning but may not be able to do so.